WASHINGTON — Officials representing the United States, Canada and Mexico expressed support for advancing the treaty that is meant to serve as a replacement for the North American Free Trade Agreement. The U.S.-Mexico-Canada Agreement was announced in late September as an update to NAFTA, which took effect in 1994. President Donald Trump, Canadian Prime Minister Justin Trudeau and outgoing Mexican President Enrique Pena Nieto signed an authorization for USMCA on Nov. 30 at the Group of 20 summit in Buenos Aires, Argentina. The deal still needs to be ratified by Congress. San Diego Mayor Kevin Faulconer said the modernized agreement is important for maintaining ties between his city and its Mexican neighbor, Tijuana. Faulconer led a discussion among other mayors and ambassadors on trade at the U.S. Conference of Mayors’ winter meeting Jan. 23. He said his goal is to get Congress to sign USMCA into action. 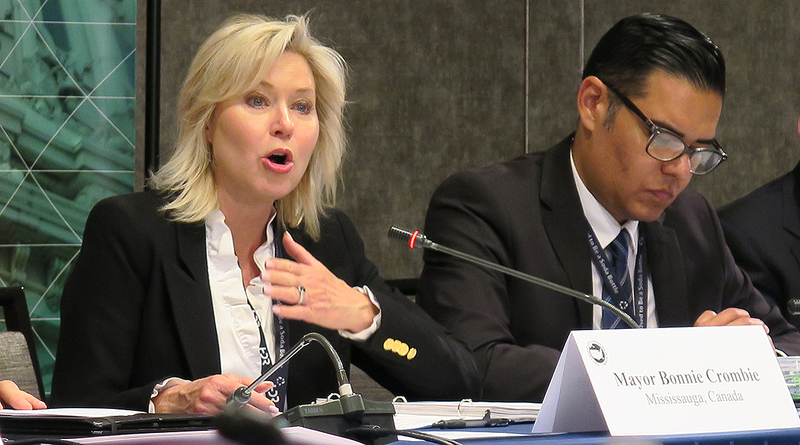 Bonnie Crombie, mayor of Mississauga, Ontario, said more than 14 million jobs depend on free trade between Canada and the United States. Mississauga, a neighbor of Toronto, is one of the largest cities in Canada. Crombie pointed out that Canada is the No. 1 customer of 36 states and that 20 million Canadians visit the United States annually, contributing to the nation’s tourism industry. Martha Bárcena, Mexican ambassador to the United States, also supports USMCA. Although she said NAFTA brought benefits to Mexico, she recognized its unevenness and said that a new treaty was needed. C.J. Mahoney, deputy United States Trade Representative for investment, services, labor, environment, Africa, China and the Western Hemisphere, praised the agreement as a much-needed update to the “relic” that was NAFTA. In particular, he lauded the deal’s limits on tariffs and measures to protect labor organizers and wildlife. Mahoney, who was confirmed in March 2018, said the White House fully backs USMCA. He called on the mayors gathered before him to urge their congressional representatives to support the agreement. Mahoney said he hopes USMCA will create a standard for trade with the rest of the world, an idea that MacNaughton echoed.